Works of the outstanding master of the brush, Tahir Salakhov, are presented at the Beijing Art Festival. 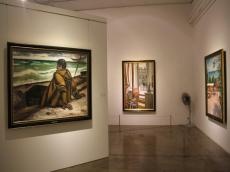 Chinese art lovers had an opportunity to get acquainted with 20 works of the artist in various styles, Azertac reported. Beijing Art Festival provides exhibitions of famous artists, sculptors, designers and other artists, master classes, lectures and seminars. Being China's main center for contemporary art, Beijing has the county’s highest concentration of art galleries. The exhibition, which became a great contribution to cultural cooperation between Azerbaijan and China will last one month. The similar exhibition will be held in Taiwan. Tahir Salakhov, one of the most prominent representatives of the Azerbaijani art, is the vice-president and honorary president of the International Association of Plastic Arts of UNESCO, the vice-president of the Russian Academy of Arts, People's Artist of the USSR, Azerbaijan and Russia, and is the winner of a number of high awards, including the State Prize of the USSR and Azerbaijan. His paintings such as “Oilmen”, “Portrait of Gara Garayev”, “Woman of Absheron” and “Aydan” have become the most beloved works of the artist. Today Salakhov lives in Moscow, where he is a professor and has a studio at the Moscow Art Institute.